These little tarts were a delight to make and eat. They also kept well in the fridge for a few days without the pastry becoming soft, which means you can make them in advance for a dinner party dessert or afternoon tea. I love to make desserts for entertaining which can be done well in advance. Making the salted caramel in my house always causes a calamity. My family all argue as to who is going to lick the bowl and the spoon. I make double the recipe amount and keep it in a glass jar in the fridge (right in the back, well hidden.) This way you always have a little for a bowl of icecream or to drizzle over a pavlova when you have the urge to make a treat for the family. I have used this pastry recipe previously as it works well and tastes great. The pastry recipe was adapted from Gluten-free & Easy by Sara Lewis. The Chocolate Mousse recipe was adapted from How to be a Domestic Goddess by Nigella Lawson. I used the Le Creuset 12 cup mini muffin tray for this recipe. The pastry made 12 little tarts perfectly, with a bit to spare. Place all the flours, xanthan gum and sugar into the food processor and mix very well. Add the cold butter and blitz until the mix resembles fine breadcrumbs. Pour in the egg and the cold water, one teaspoon at a time, until the dough comes together. It must not be too sticky. Remove it from the processor and roll it into a flat disk. Wrap it in clingfilm and put it into the fridge for 1-2 hours. Once the dough is nicely chilled, remove from the fridge and roll it on a rice floured counter, to the thickness of about 4mm. Use a cutter to cut out 12 little disks. I used a 7.5 cm cutter. Press them into the muffin tray. Don’t worry if the dough breaks and tears, simply patch it with little pieces of pastry. Chill the pastry cases for 10 minutes in the fridge after this. Bake the pastry in the oven for 7- 10 minutes till golden. The amazing thing about this very verastile pastry is I did not need to fill each little muffin hole with paper and dried beans. I simply baked them. These little pastry cases can then be stored for a week in an airtight container for use at a later date if you don’t want to fill them with the chocolate mousse. So simple and delicious. Beat the cream and mascarpone together and fold in the melted and slightly cooled chocolate. Be careful not to over whip the cream as you don’t want it too thick; however a little unwhipped cream added at the end will lossen it up if you are a little heavy handed. Fill a piping bag or simply spoon the mousse into the pastry cases. You can leave the tarts like this and top with fruit if you like. If you are going to top them with caramel then you will need to flatten and smooth the mousse down with a knife. You will need a sugar thermometer for this recipe. Put the sugar, agave and 150ml water in a heavy based saucepan with a sugar thermometer. Bring to a boil over a high heat until the sugar has dissolved. You really don’t need to stir it, just make sure there is no sugar sitting on the side of the pot. If this is the case use a wet pastry brush to brush it off. Meanwhile, in another saucepan, heat the cream and the salt until the salt has dissolved. Once the sugar mix has reached 180 degrees, it should be quite dark in colour, remove from the heat. Be very careful as it is very hot. Whisk the cream into the sugar mix. It will bubble and sputter, so pour the cream slowly while you whisk. It is a good idea to do this over the sink. Leave this to cool before pouring it in a glass jar. Once your caramel is lovely and cool, you can spoon a little onto each tart and smooth with the back of a spoon. 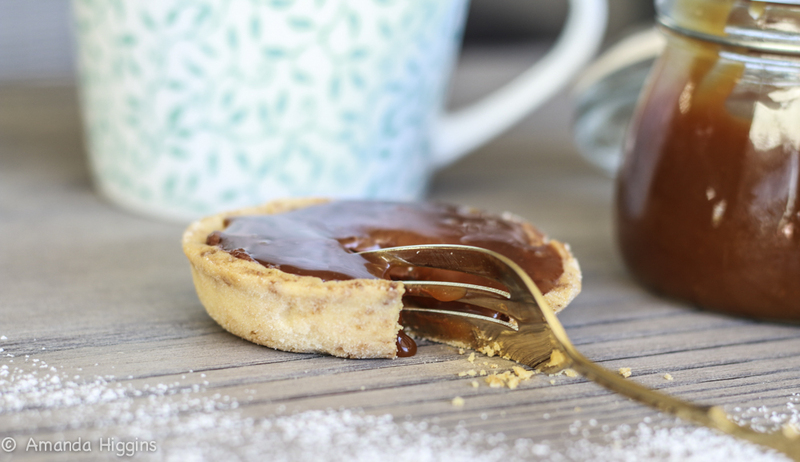 I love this recipe because if you only need a few little tarts for tea, you will have made spare tart cases and caramel for later in the week. Bonus!